Oh you’re in for it now! I present you with a recipe that will both shock and awe your tastebuds. 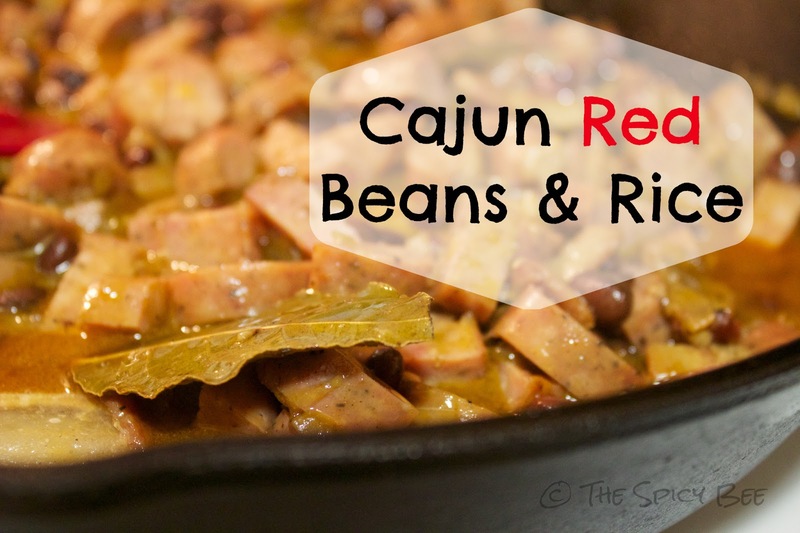 Choose to play with the cayenne pepper, and you will make yourself cry with this recipe of cajun red beans and rice (trust me because we’ve done it–so deliciously painful). Bringing the heat this Tuesday morning! Let’s cut straight to the bacon. 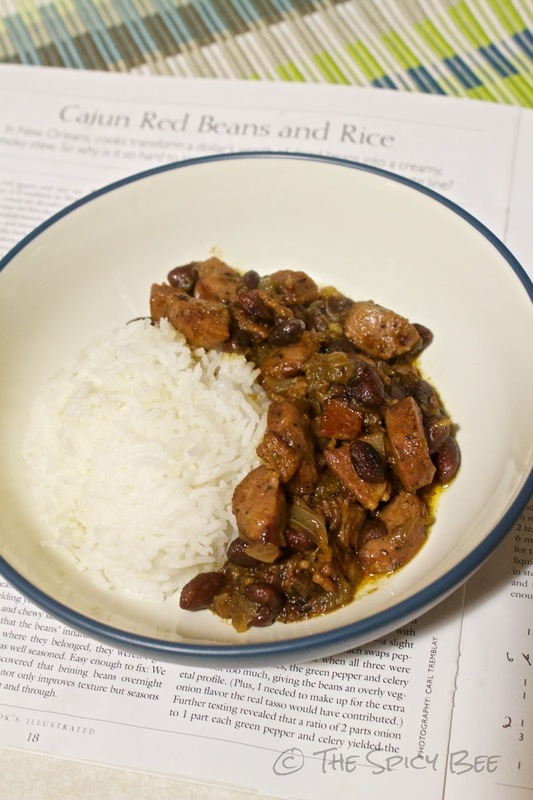 How you cook it is very important to how the red beans and rice come out. Please, if you can, cook the bacon on the stove–if you’d prefer, cook in the oven and reserve the bacon grease for your pan. Microwaves need not apply. 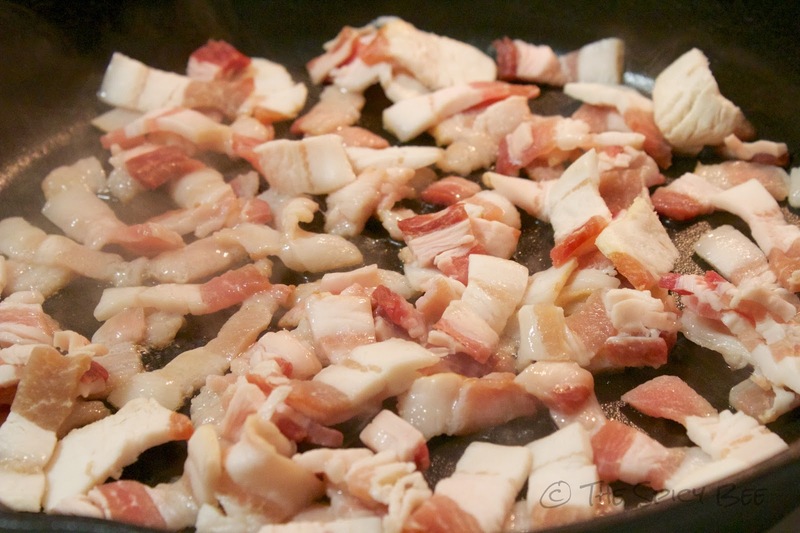 If you did oven cook the bacon, reserve a 1/2 T (heck up to 1 T) of bacon grease and add it to your skillet with the bacon, onions, celery, and green pepper, cooking until softened (if you stove cooked the bacon, simply add the aforementioned ingredients). Stir in bay leaves, cayenne, thyme, and black pepper. Next add in the beans, broth and water, and bring to a steady boil for 4-5 minutes. Reduce the heat and simmer vigorously, remembering to stir occasionally. Add more water to reduce sticking to bottom of the pan. Cook until the beans are soft and the liquid thickens (about 40 minutes). Stir in the sausage and red wine vinegar. Now would be a good time to start your rice (depending how you cook it–we use a rice cooker, and I believe it takes about 25 minutes to cycle). 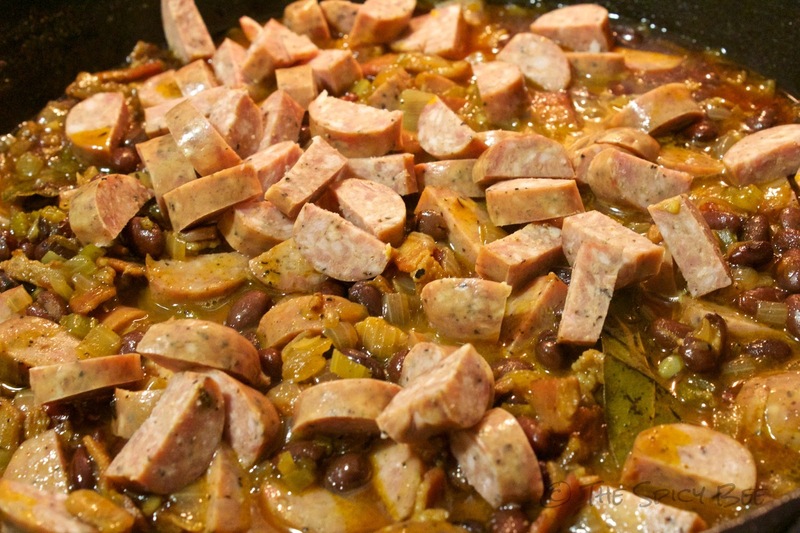 You’re good simmering for another 30 minutes, until the dish is creamy and the beans are very tender. Don’t forget to salt to taste! 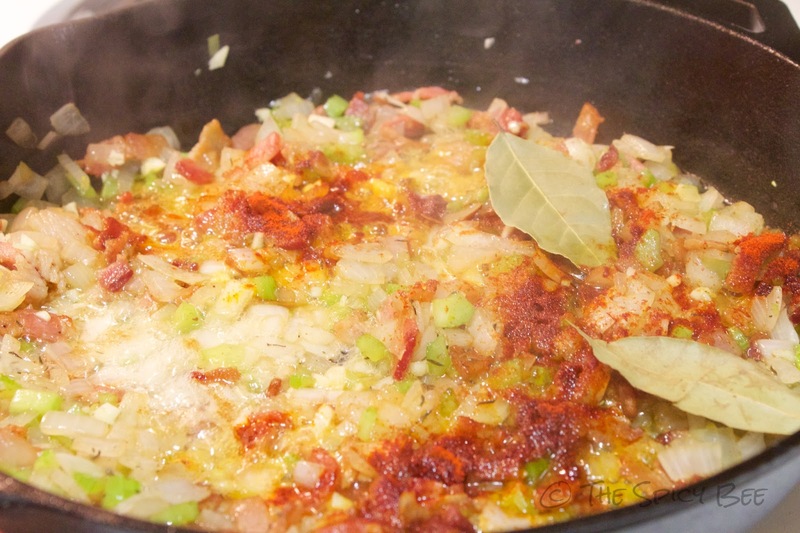 Remove the bay leaves, and serve over rice, topped with scallions. Evidently we were out of scallions. This recipe is literally one of our hands down favorites to make during the week. Even though it’s long, the recipe’s fairly easy to cook up, and just typing up the recipe gives me a hankering for some. How convenient, I also happen to be writing my grocery list for the week! Done. What’s your all-time favorite dinner recipe? Man, that looks awesome! I think I might have to try this one. Thanks for the sausage recommendations!